So first of all I'd like to thank Misa for organizing this competition! There was one scan by Kunie Kanbara that everyone had to use. The other entries of the competition and opinions of the judges can be found here. I'd like to say a few things on my submission concerning its intended meaning and inspiration. When I started working on my entry I felt a bit lost. The movement of the head, that is the scan that we had to use, was quite weird to work with. I started to make sketches and first thing I knew was, that I want the person to look at someone. :) So I made one sketch after the other, for a change I drew everything in Illustrator from the very beginning. I guess that was the most difficult part, to create this body to the head. Since I love to listen to music while I am working on Illustrator or Photoshop I had Bjoerk's greatest hits dvd running again and again. And in the video "Cocoon" she is being wrapped up by red lines. I love most of Bjoerk's videos, can only recommend you to get this DVD... but the red string inspired me for this wallpaper. So I decided to connect both my characters with such a red string. Another song that inspired me for the title was "If you go away" by Dusty Springfield. I played around with colors. But for me the gray together with the red is the only possible way for my intended meaning. 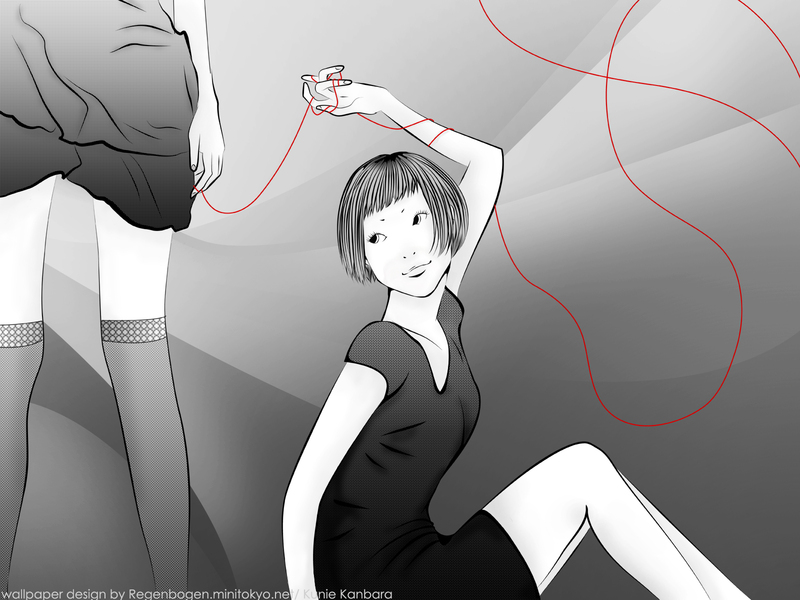 If the clothes of the girls are colored as well, the red string gets lost. Same goes for adding background... so I kept it really "simple", to put an emphasize on what I want to express. Thanks again to Misa and the judges cassandraronald, DREAM, flyindreams, k1ru, mentis, midsummer, saikusa! Even though I was the organisor of areteii (pssh, shush :P), this wallpaper definitely deserves a highlight. The original scan itself was quite easy and hard to work with at the same time: there was only a head (and a cut off head at that), a strange angle looking at something (but undefined), and there weren't many clues in other Kunie scans you'd find in the gallery: they're all the same blank/ one coloured kind of background scans. This work stands out so much because Regenbogen has chosen to move away from the vibrant colours characteristic of Kunie's art and moved into monochrome phase- the red against the greys, whites and the blacks stand out and sure will leave an impression on you. Even with the absence of colour, the feeling you get from the original scan is not lost: it's refreshing and inspirational. What's more, the bodies were drawn completely from scratch and if you haven't even seen the original scan, you wouldn't even be able to tell. Truly beautiful wallpaper and choc-loads of effort and thought gone into this. May this inspire you too! Proposed by MapleRose and highlighted by kuroimisa. So much work is obviously put in this, and so many creativity was needed... I'm truly impressed! woah: my first post disappeared into the great beyond. so i shall try again. "lovely monochrome wall complemented with beautiful patterns on both ladies and excellent choice of the red string to break up the monotony; would have been ideally served with constant outlines [stroke] on the girls arms and legs specifically, and perhaps a bg with stronger shapes and or a few patterns." i neglected to mention there how impressed i was by all your "bodily" additions. originally i wanted to wall the scan myself but couldn't conceive of an acceptable wall. You should have won....I love your wallpaper.. It was just...amazing, so insipiring. Yesh. You rock for giving her a body. "Whoa. You make the whole body with that head? Great job! Its not easy to imagine a nice body pose with that head in my opinion, but you do it xD I love the colors, they are black-gray-white (my all time favorite colors) and the red thread Its really nice." bogen just let me tell you that as everyone else I was pretty much shocked to see the scan with a full body, against that there was no chance, I particularly got interested in your concept about it, I do see and feel as you the romantic content and I enjoy the fact that the colors are the ones showing/expressing everything, the gray as the neutral tone, necessary to make the red of the bond emerge, it is lovely, and just to make it more dramatic I would have taken out the smile on the girl's face but that's nothing against my love for the whole thing. congratulations for the inspiration and the wonderful piece and well you know I hope you are doing fine, as I see you are now kind of more active, that's always good, so ciao ciao. I love monochromatic colour, and the red lines create perfect combination. You can actually draw her body, and matched it with the head. That's really inspiring! I'm still shocked how you drew her body because it matches perfectly like garra said.